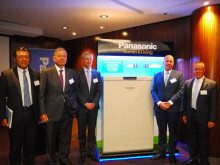 Sydney, Australia - On June 2, 2015, Panasonic Australia announced pilot projects with ActewAGL, Snowy Hydro's Red Energy and Ergon Energy to install Panasonic battery technology in solar-installed homes for the first time, generating efficient, environmentally responsible electricity to 'shave' concentrated energy demand. Storage batteries have the capability to allow more solar energy to be used, with Panasonic modelling for the Australian market showing that the system could increase the self-consumption rate of solar generation from 30 per cent up to as much as 60 per cent. The residential battery technology stores excess electricity generated during the day by solar panels to provide a reliable, efficient base load for solar-installed households during peak periods. It also will provide emergency power for critical appliances - such as the refrigerator or lighting - in case of sudden grid supply interruptions. 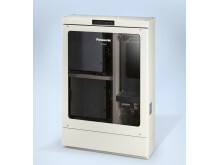 Once fully charged from the day's sun, Panasonic's lithium-ion storage battery produces a two kilowatt output for four hours. Panasonic Australia's Managing Director Paul Reid said the battery storage demand response control will allow retailers to trial different charge/discharge programs to evaluate the effects of distributed storage. "Over the 10-year plus life cycle of the battery, our modelling is showing a significant reduction in the reliance of Australian households on the grid during peak periods." "The pilot projects are a first for Panasonic in Australia, and Panasonic's battery demand response system will help distributors model peak shaving effects, realised through solar and battery storage systems and provide a cost effective alternative to grid infrastructure investments." 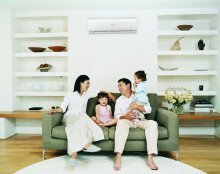 "For consumers, it means access to clean solar energy during the evening peak and potentially a lower energy bill. For the retailer, we can provide a levelling out of costs and a potential competitive advantage with customers. For the distributor, we can provide a cost effective alternative to expensive grid infrastructure investments." "And if you're a town developer, our battery storage solution may provide a cost effective alternative to otherwise costly network connection and upgrade expenses." The pilot projects will be implemented in a selected zone of customers with solar-installed households in Australian Capital Territory (ACT), New South Wales and Queensland, using Panasonic's residential energy storage system to complete the analysis. Panasonic is well known for its world-leading innovation, R&D and technological advancement in battery management, delivering innovative industrial-scale products and solutions that benefit the community in new ways. According to Mr. Reid, "Panasonic's 40 years of accumulated know-how and expertise in lithium-ion battery technology will be brought to bear to help Australia to meet challenges facing its energy system. It is an opportunity to bring new flexibility to the energy sector, simply by tapping into a huge latent energy source readily available in many of Australia's 1.4 million solar-installed homes." 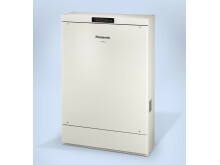 Panasonic displayed the Residential Storage Battery System at the Australian Energy Storage Exhibition, which took place at the Australian Technology Park in Sydney from 3 to 4 June, 2015. 8-kWh usable capacity and 2-kWh output, using lithium-ion battery technology to maximize the benefit of residential photovoltaic (PV) energy. Demand Response aids utilities' fleet management to meet peak shaving opportunity and improve load stability across the distributed energy network. One utility server can control up to 20,000 storage systems and monitor their time of use tariffs and control of demand load. If all units were used at once, 40 megawatts would be produced. 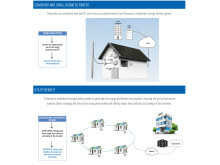 The Demand Response software can then help utilities redistribute time of use tariffs and Li-ion battery storage energy via the DR-EMS server to manage household electricity. The products will be manufactured by Panasonic in Japan, and will be commercially available from October 2015. With more than 40 years of expertise in the field and sales of more than 10 billion lithium-ion cells to date, Panasonic Corporation has a global track record of producing world-leading battery technology and innovation over many decades.